The driver is recommended not to concern himself with the display controls while driving. 3. Date - Display zone. When the outside temperature is between +3 °C and –3 °C, the temperature display flashes (risk of ice). A. Access to the multifunction display main menu. B. Cancellation of the operation or return to the previous display. C. Scrolling through the multifunction display menus. Validation using steering wheel controls. D. Validation using radio panel. Note: The outside temperature displayed may be higher than the actual temperature if the vehicle is stationary in bright sunlight. Press on control A to the right of the steering wheel to display the multifunction display “Main Menu”. The display brightness and contrast. The units used for the outside temperature display. 2 Using C, select the “Brightness - video adjustments” menu. Confirm by pressing on C on the steering wheel or on D on the radio panel. 3 Select the display configuration with a press on C. Confirm by pressing on C on the steering wheel or on D on the radio panel. 4 Select the brightness adjustment. Confirm by pressing on C on the steering wheel or on D on the radio panel. 5 Using C, select normal or alternative display mode, then validate by pressing on C on the steering wheel or on D on the radio panel. To adjust the brightness, select “+” or “-” and confirm the adjustment by pressing on C.
6 Validate “OK” on the screen. 2 Using C, select the “Date and time adjustment” menu. Confirm by pressing on C on the steering wheel or on D on the radio panel. 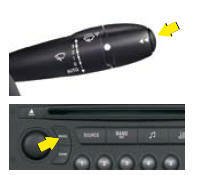 4 Using B, adjust the date and time, then confirm by pressing on C on the steering wheel or on D on the radio panel. 5 Press C to select the values you wish to modify. Confirm by pressing on C on the steering wheel or on D on the radio panel. 2 Using C, select the “Choice of temperature unit” menu. Confirm by pressing on C on the steering wheel or on D on the radio panel. 3 Select the unit using C. Confirm by pressing on C on the steering wheel or on D on the radio panel. 4 Validate “OK” on the screen. Consecutive presses on the end of the wiper control stalk or the MODE button on the radio allow you to select the type of information presented on the multifunction display (date or radio/CD/CD MP3/ CD changer). The driver is advised not to use the controls described opposite whilst driving. A. Access to the telematics multifunction display menu. C. Scrolling through the menus of the telematics multifunction display. E. Selection of the type of information presented on the telematics multifunction display (date, radio/CD/CD MP3/CD changer/ jukebox, navigation information, telephone). allows you to adjust various settings (date, time...). allows you to adjust various video settings. Press on the MENU button. Rotate the control to select the Configuration icon. Press on the control to validate. 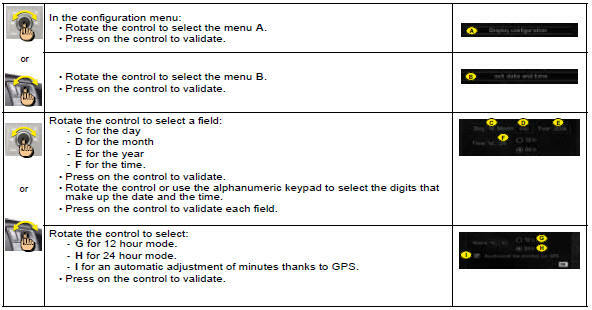 Other functions of the configuration menu: See NaviDrive instructions.